Hi Guys! I'm in senior year of high school, and I'm going to college next year and life is just going to get more and more busy. I realized that I can't possibly do all of this by myself, so I've decided to LOOK FOR A CO-BLOGGER! -- YOU GET TO BE BOOK FRIENDS WITH ME! -- Interview the newest authors! If I think we're a good fit, we'll be co-blogging in to time! 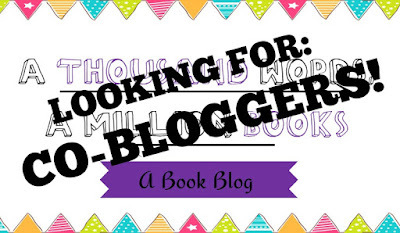 I SINCERELY hope you guys would like to blog with me!